In a joint collaboration with America’s Test Kitchen, National Geographic publishes its first cookbook. 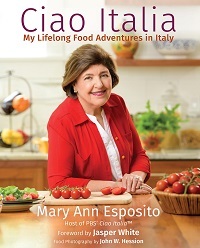 Food authors Bone and Croce divide the recipes into the three areas in Italy, subdivided by 20 administrative regions beginning with Valle d’Aosta and ending with the island of Sardinia. Following a description of the area are recipes accompanied by photos of the region and or the dish. Each recipe begins with “Why this recipe works.” For example, dry-aged beef with arugula and parmigiano is paired with arugula, olive oil, lemon juice, and cheese. For those who like to make pasta, there’s a simple recipe for semolina pasta. There are a few complex dessert recipes, but others, such as pistachio gelato, are both delicious and easy to accessible. Includes a glossary and table of metric conversions. Italian chef Contaldo (Panetteria), known for his association with fellow chef Jamie Oliver, focuses on how home cooks can prepare meals for an average week night. 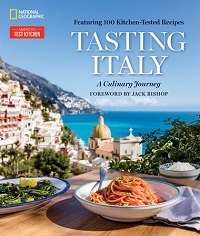 Featuring recipes that are organized by main ingredient, the varied chapters offer preparations for sauces, pastas, risotto, fish, meat, and even a short recipe on vegetables. 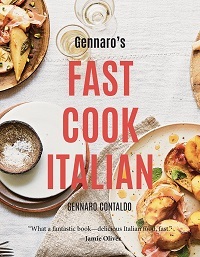 Cook times are given for each recipe, and range from just a few to 30–40 minutes, with the longer-timed dishes clustered in the risotto chapter. Brief commentary combines with serving suggestions or thoughts on ingredients. The useful index and colorful, bright photos further make this a delightful text to browse. 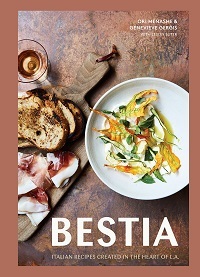 Despite its hard-to-find location in Los Angeles, Bestia restaurant was a hit from the start and continues to be a coveted reservation. Husband-wife owners Menashe and Genevieve Gergis; he is the head chef, she is the pastry chef, together with food journalist Lesley Suter, have a produced an attractive book highlighting their full-flavored, Italian-based food. Like many restaurant books, this one assumes a fair bit of culinary knowledge, with large sections on charcuterie and pickling, as well as recipes that call for a dehydrator as well as access to specialized ingredients. But the dedicated cook looking to replicate the Bestia experience will be rewarded with recipes such as scallop crudo with citrus and dried olives, pici with saffron lamb ragu, and slow-roasted suckling pig. Among the most intriguing recipes are starters; several of the main dishes utilize a grill, which may be of limited use to some readers, but the pizza recipes instruct on using a home oven and a large section on desserts offers many tips for success.